I know what you're thinking...I just posted about Afternoon Tea 10 days ago-you're right, what can I say, I have a penchant for itty bitty sandwiches and all the cake! 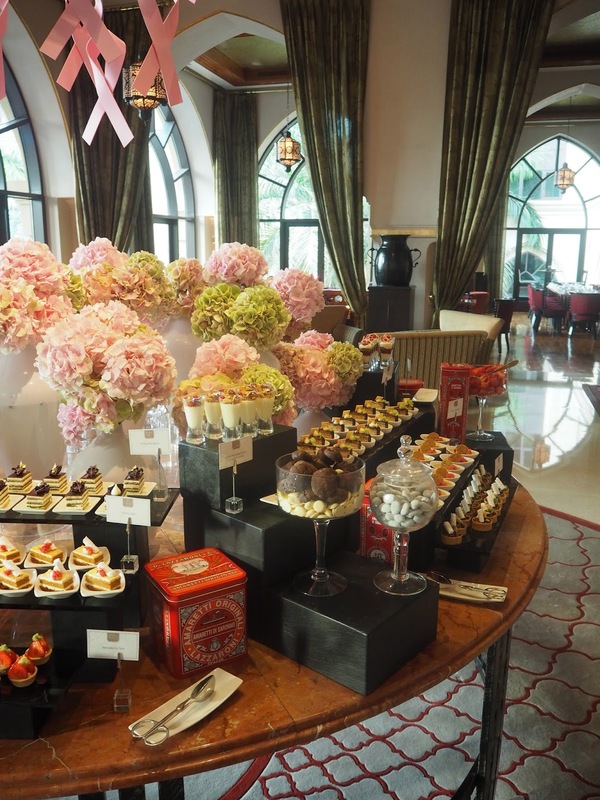 I wanted to post about this one at The Palace because a) its the third time I have been and I love it so much (I posted about it first here) b) it's the only afternoon tea I know of in Dubai that offers a buffet style tea (currently offered on a Wednesday and Sunday) and c) if you live in Dubai or are visiting I highly recommend it. Oh and d) I went with my parents and I am really missing them now they are back in the UK. So sit back and enjoy pictures of cake-hope it doesn't make you too hungry! When we visited this time there was a 'honey' theme to the afternoon tea with honey tastings. 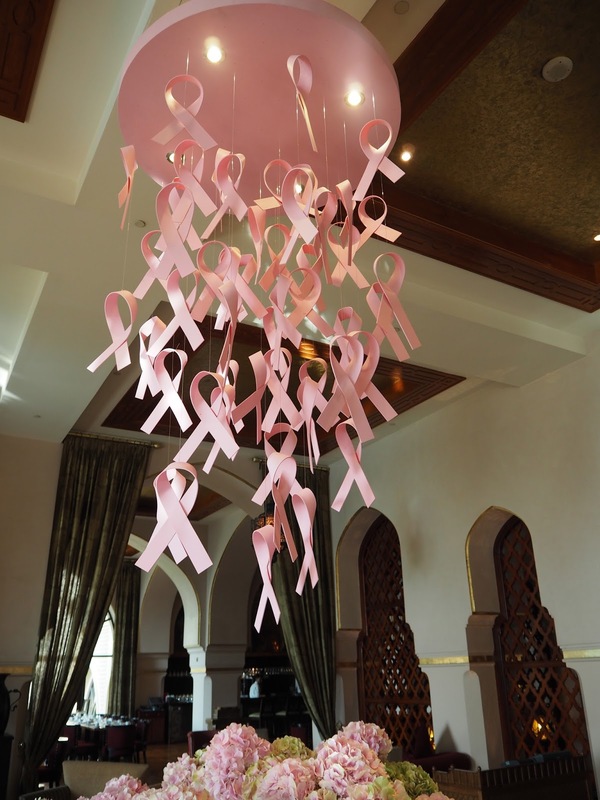 There was also a 'breast cancer awareness month' theme and the decorations above the cake/sandwich table were very striking. The sandwiches are just to die for here-the chicken and chive mayo seems to be a staple and it's absolutely delicious. The cream cheese with pecan, smoked salmon roulade and the melted goats cheese with grape were my favourite from the selection on offer. As you can see the attention to detail is just astounding-can you imagine making all of these individual desserts by hand? I love edible gold leaf! The scones here admittedly aren't my favourite, I find them quite heavy and doughy but the jam is delicious. There were two types of scones available, traditional and green tea. 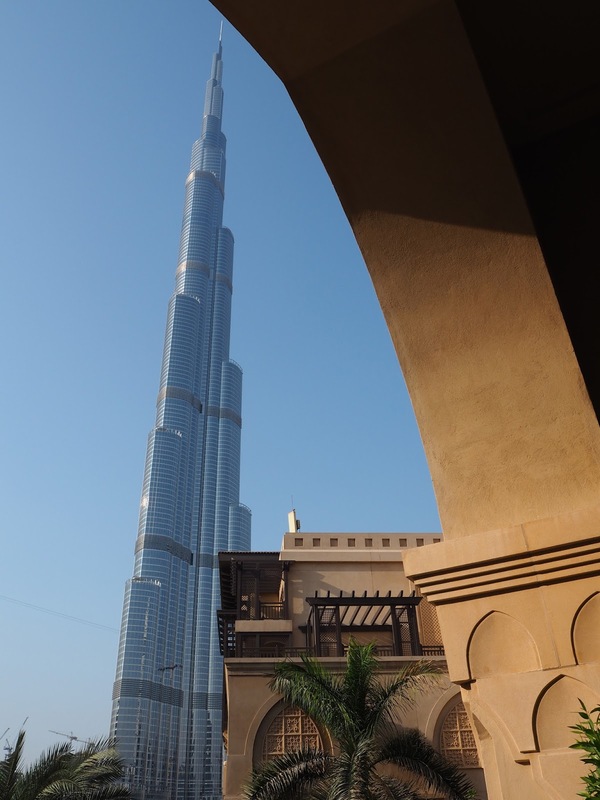 The view from the terrace outside is quite stunning-the Burj Khalifa in all it's glittery glory to the right and the hotel pool ahead-it's very peaceful given the hub of activity all around this area. This is a lovely way to spend a lazy afternoon with friends or family and the food, setting and value for money really can't be beaten I think. There's something for everyone and you definitely won't leave hungry! On the other days to the buffet they do the traditional stand afternoon tea which you can read about here-it may have changed as it's a couple of years since I took my parents but I personally think the buffet is much better for fussy eaters like me! PS-not a sponsored post-I booked and paid for this myself, I just love it and think it is worthy of a blog post!